I am delighted to have Scottish author Barbara Henderson back on my blog, having interviewed her about her first book Fir for Luck on my blog almost two years ago. Her third book is Wilderness Wars, an eco-thriller set on a remote Scottish Island. Which is a wonderful twist of several genres, survival on a remote island, family, and the developers ignoring the environment set the scene for what follows. The environment fights back and takes on a supernatural force of its own. In all three of Barbara’s books she has shown that she clearly knows the natural environments of Scotland and has the skill to take her reader there. But, in Wilderness Wars she has absolutely nailed it. Striking a beautiful balance between character led prose and spot on description that you really feel like you are there, which combined with twist and turns and suspense is quite something. The laying as the two main characters Em and Zac learn about themselves and begin to work out what is happening on the Island and the hints that perhaps something more than unlucky mishaps is going on is superb. I highly recommend it for everyone aged 9 years and above, including adults. When I talked to you on my blog two years ago about your debut book Fir for Luck. You said one of your family holidays inspired the story, as you discovered a remote clearance village, which was the inspiration for your story. How have your family holidays to the Scottish Wilderness helped to inspire Wilderness Wars? I am so lucky in that I live close to a lot of the types of places which helped to create the island world in Wilderness Wars. My base in Inverness can be annoying at times – any city is 2-3 hours away – but you can drive for a very short time before you reach the sea, or the wilderness, or both. It’s one of the factors which drew us to the region. Holidays on Harris, with its white beaches and turquoise seas, Lewis, Mull, Iona, Skye, Islay, Assynt and Sutherland… all these played into the world I tried to create, and each memory contributed a little. Some observations, such as seeing the seal move elegantly underwater from a hilltop, coral beaches and being dive-bombed by gulls are all directly lifted from holiday memories. I defy anyone not to be inspired by places like these – there is awe, but also a certain vulnerability as you realise how far you are from anywhere. Both are natural responses, and I hope that Wilderness Wars features a little of that balance. In both Fir for Luck and Wilderness Wars there is a close connection with the characters to the land and they and their families depend on it for their survival. But, the context of Wilderness Wars is very different. It is not the people that are trying to stop them but nature itself. Tell me a more about the ways that nature fights back and how you selected the ways it does? There is a lot more I could have done, a lot more facets of the wild world I could have included. The bottom line is, I wanted a slow escalation, so that initially, the setbacks for the building project would look like mishaps and accidents, before, without the reader realising it, we have moved into something a little bit more supernatural: the wilderness as a sentient force. So initially, the workforce on Skelsay have to contend with small accidents, freak weather, rodents, an inconvenient site for a protected species. If they run roughshod over these, as they do, there is an escalation until we are looking at the inevitable life or death showdown. I liked the fact that it begins with small, explicable things and I wanted to ask myself the question – if nature, as a whole, could fight back against our blinkered, short-sighted, selfish little meddling – what would it do? It’s the classic Man-versus-Nature conflict, but with a bit of a moral twist. 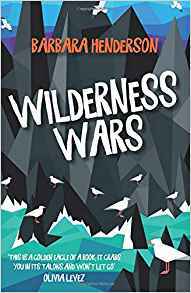 In your opening chapters of Wilderness Wars you cleverly balance Em’s curiosity about the new environment she is going to live in, with another less friendly side, such as being pecked by seal gulls on the ferry and wild whether resulting in container being dropped in the sea. Can you explain more about how you balanced building up a picture of a ‘conspiring, sinister nature’ with Em and her friend Zac developing their understanding of the Island and a respect for the wilderness on the island? It was really important to me that both sides should be shown – nature, respected and left to its own devices, is not a threat in the book. I love the wild landscapes and am definitely at my happiest and most peaceful when I am in such places. But in the book, the wilderness, threatened by thoughtless development and needless interference, certainly is dangerous. It’s an element of the supernatural, designed to make a wider point about the way we make choices, questioning rather than scaremongering, I hope. The book ends on a very positive note, although I have to admit to terrifying myself with the chapters near the end. But maybe Wilderness Wars can also be read as whatever you want it to be: a love letter to the wilderness, an adventure story in its own right, a book about integrity, isolation, friendship and finding your place in the world.